An artist's illustration of Chinese astronauts spacewalking outside their Shenzhou spacecraft. Future Shenzhou missions will feature spacewalks ahead of orbital rendezvous and docking demonstrations. China has successfully tested the spacesuits and airlock tobe used in its first-ever spacewalk during a spaceflight later this year, thenation?s state-run media has reported. The spacewalk will take place during the Shenzhou 7 mission,China's third manned spaceflight, which is set to launch from Jiuquan, Gansuprovince, in October 2008, according to recent reports by the Xinhua NewsAgency and China Daily. 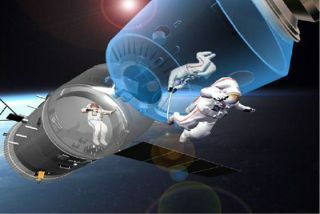 "Both the airlock module and the extravehicularspacesuit passed the tests, which simulated the zero-gravity environment ofspace," China Daily quoted Yang Baohua, head of the China Academyof Space Technology, as saying. "This boosts our confidence in the spacewalk." The extravehicular spacesuits and airlock are new technologiesfor China?s manned Shenzhou missions, since the country?s two previousastronaut crews did not leave the protection of their spacecraft during theirflights. The airlock is a pressure chamber that Chinese astronauts,also known as ?taikonauts,? will pass through on their way from Shenzhou to thevacuum of space outside. Spacesuits are vital for work outside a spacecraft sincethey shield astronauts from the radiation and temperature changes of space, aswell as provide them with food, oxygen and communication gear. They are much morechallenging to design than the simple suits worn by astronauts inside thevehicle, Chinese space officials have said. ShanghaiDaily reported the new suits cost $20 million and weigh 220 pounds(100 kg) on Earth. China is only the third country after Russia and the U.S. toindependently launch astronauts into space. The nation?s Shenzhouspacecraft are based on Russia?s three-module Soyuz vehicles, but have beenmodernized by Chinese engineers. While China has not named the threecrewmembers for the Shenzhou 7 mission, 14 candidates are training for thespaceflight. Among them are Yang Liwei, who became his country?s first spaceflyerduring the 2003 Shenzhou 5 mission, and FeiJunlong and Nie Haisheng, who crewed China's second crewed mission,Shenzhou 6, in 2005. China is expected to broadcast the upcoming spacewalk live, ChinaDaily reported. The extravehicular excursion is slated to last about 30minutes, and include one or two astronauts, according to past reports.During the spacewalk, the astronauts will tighten screws and install equipment,Xinhua reported. The mission is expected to bring China one step closertoward their goal of establishing an orbital space station and making a manned tripto the moon. Thecountry?s Shenzhou spacecraft include an orbital module that can remain inspace to carry out experiments after the crew comes home in the reentry module.The orbitalmodule is outfitted with solar arrays to supply it with power, and couldbecome the base for a space station or a docking target for future spacecraft. Shenzhou's reentry module is the world's largest, with moreavailable space than any other, said Yang Baohua of the China Academy of SpaceTechnology, according to China Daily.